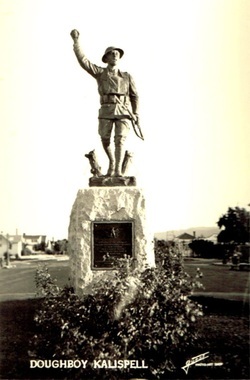 The Doughboy at its former location in Kalispell, Montana. The Viquesney Doughboy that once stood in Kalispell, Montana was moved to Columbia Falls in 1972. The Doughboy at Kalispell, 1963. The photo at left, taken in 1963, shows the Doughboy survived in good condition until then. The photo above, taken only a few years later, shows that damage had occurred, with the rifle now bent and missing its sling, and the right arm bent forward. The statue still exists in this condition at its new location at Columbia Falls. 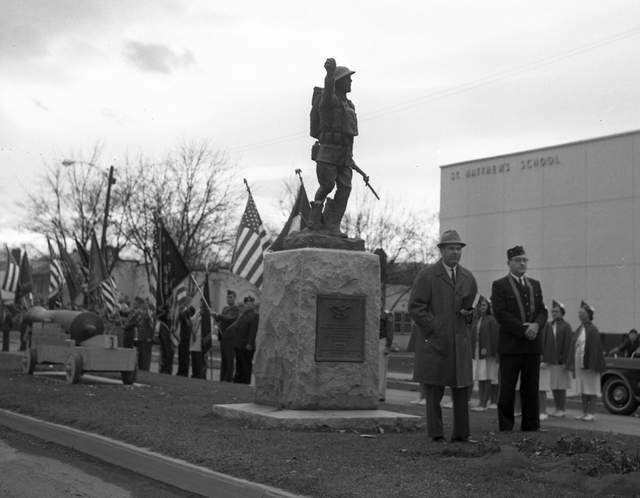 A ceremony at the Doughboy in Kalispell. Photo: The Daily Inter Lake, Kalispell, Montana.